To reach iGoogle, visit http://partnerpage.google.com/yourdomain.com. Be sure to replace “yourdomain.com” with your actual domain name. 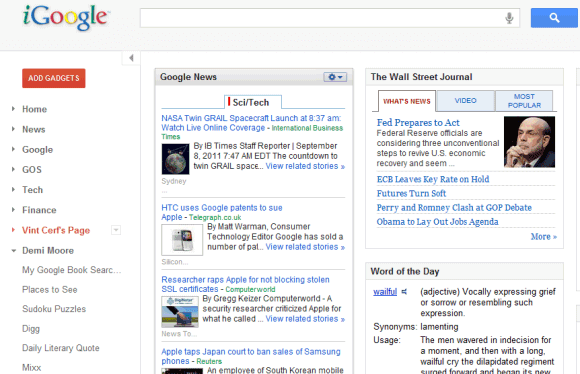 Google Search tests a new feature that lets you add an iGoogle gadget corresponding to a search result. For now, the link “add to iGoogle” is displayed for a small number of sites (BBC, New York Times, National Geographic, TVGuide.com, NPR, Flixster, Epicurious) and it’s not clear if publishers can enable it. 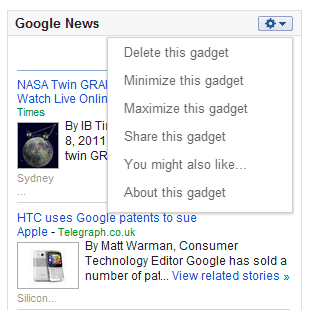 After clicking on the link “add to iGoogle” displayed next to a BBC result, Google added BBC’s official gadget to my iGoogle page. Unfortunately, Google also set a cookie value so that every time I go to google.com, it redirects me to iGoogle. Clicking on “classic home” at the top of the page solves this problem. 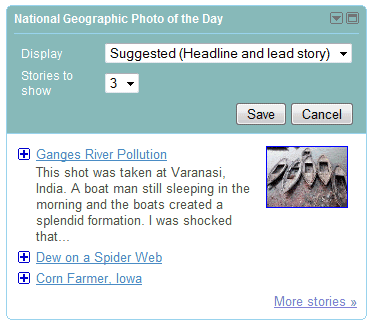 iGoogle added two new views for feeds: a slideshow view for photo feeds and a view that shows the headlines and a snippet from the lead story. You can change the view for each feed by clicking on the arrow icon, selecting “Edit settings” and choosing one of three views: headline only, headline and lead story or slideshow. By default, Google shows a small number of hand-picked feeds in the sideshow view and uses the “headline and lead story” view for feeds that support Media RSS. “These new views not only create a better experience for users, but also give publishers an opportunity to more easily expose rich content, often already present in their RSS feeds. 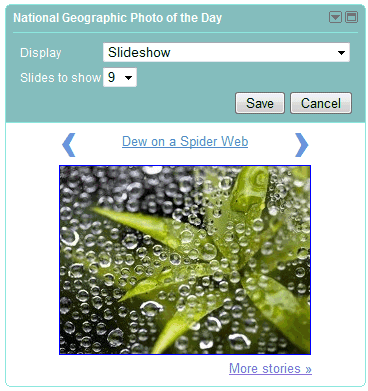 To take advantage of this new feature, publishers simply need to add images and associated Media RSS and/or enclosure elements to their existing RSS feeds. We’ll then grab the images, resize them down as necessary, and provide hosting/caching. Additionally, we’ll make the images clickable and display a 150 character snippet in the Headline and lead story view,” explains Google. There’s a guide for publishers which offers more information about the new views. 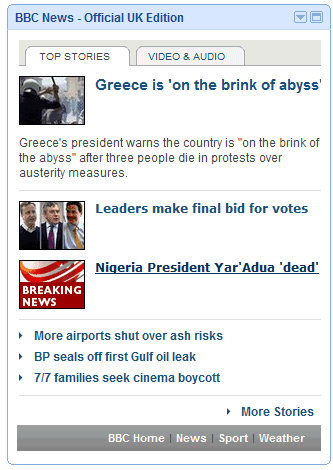 All Blogger feeds use Media RSS, so they’ll be displayed in the “headline and lead story” view. 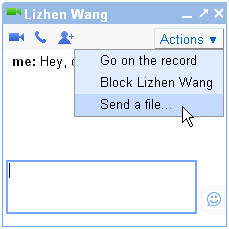 Have you ever wanted to quickly send a file to a friend who’s online? Now you can share pictures, documents and other files directly with your friends while chatting in iGoogle and orkut, without having to switch to email to send the file as an attachment. File transfer works directly in the browser so you don’t need to install anything. Just start a conversation with a friend and click “Send a file…” in the “Actions” menu. After you select a file, your friend will be asked if they want to accept the transfer. You can learn more on the Google Talkabout Blog. You might have noticed that we recently gave iGoogle and orkut chat a face lift. Several tools now have a new home at the top of the chat window. From the new toolbar, you can click the blue camera and phone icons to start video and voice chats with your friends or the group chat icon to add additional friends to a text chat. If you’ve never used video or voice chat before, all you need is a webcam and microphone attached to your computer and a small plugin application available for free at www.google.com/chat/video. We’re working to bring file transfer and the new toolbar to Gmail too. In the meantime, you can continue to access voice, video and group chat in Gmail from the “Video and More” menu in a chat window.